It’s post-frost, tidy-up season in my garden. Time to gather and clean-out seasonal pots, cut-back unattractive perennials, rake-up leaves and button-up the borders with mulch. This has been a busy year for me as I’ve begun to switch my focus away from garden design, and back to art. As a result, the garden suffered a bit of summertime neglect and I have my hands full this fall. 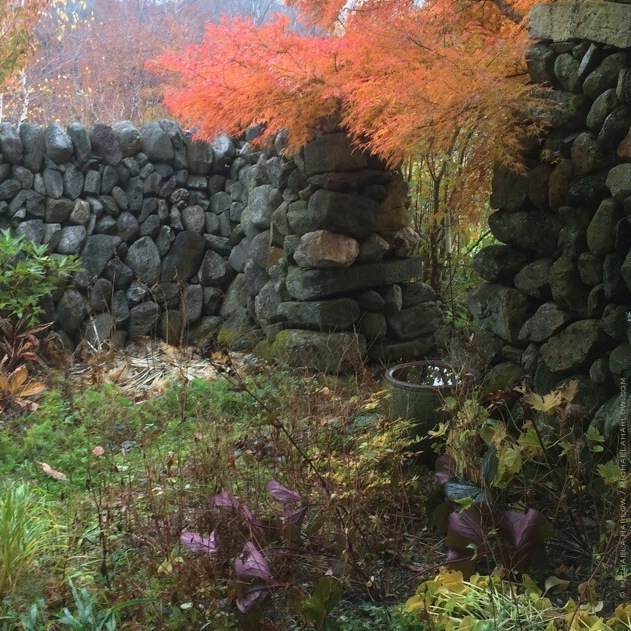 But standing here today at the Secret Garden door —gazing out at the brilliant autumn colors— I realize that by taking on fewer projects, there will be more time for this place again in the coming seasons. 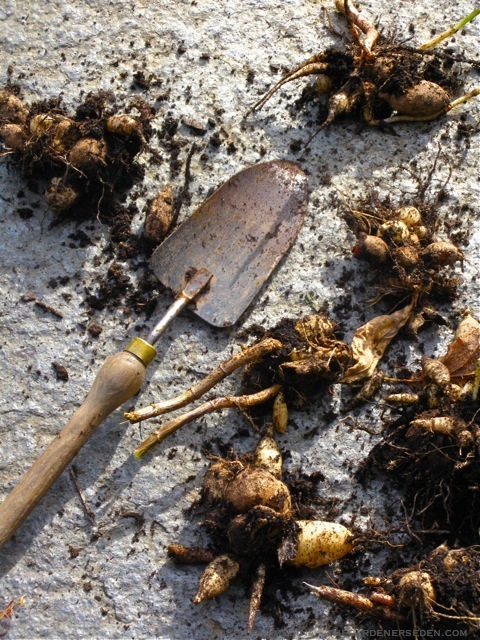 Digging and cleaning up Dahlia tubers. See past post here. Patient observation is a skill I constantly practice in gardening, and although I’m no master, I notice a bit of improvement here and there as the years pass. I’m a note taker, and thanks to my iPhone, I can both take notes and photos while out working to help remind me of garden tasks. After losing far too many Dahlia bulbs to forgetful placement, I’ve learned to flag them with tiny, red, plastic tags. I can easily spot these after the killing frost and safely dig and store my tubers in the basement. I also make note in my calendar —with audible alerts— as a reminder to pick up and plant spring bulbs. 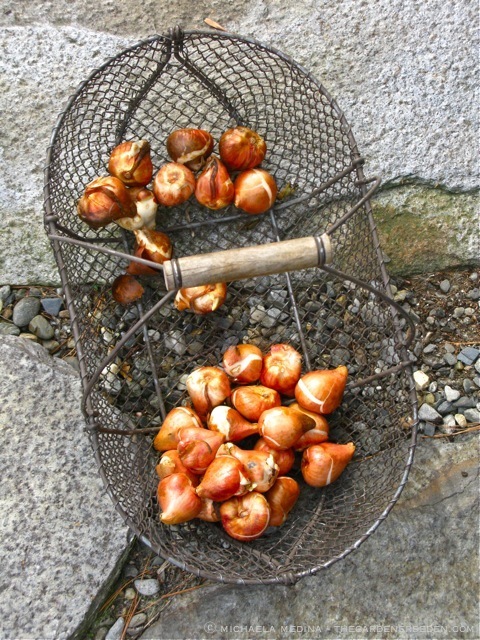 Early-spring favorites —such as Erythronium, Galanthus, Eranthus and Anemone, to name a few— must be planted in late summer or very early autumn for best results, but others —including most Tulipa and Narcissus bulbs— can be planted as long as the ground remains frost-free. So I’ve learned to shop the end-of-season sales, and often find great bargains. This is also true for deciduous trees and shrubs. A great garden can be built on a shoestring budget, with patience, luck and a bit of good timing. Over the years I’ve learned that Tulips can be planted quite late in the season, so I often grab them at bargain basement prices. What I can not plant, I will pot up and chill for forcing. Tidying up the Secret Garden room is a fun, end-of -season chore. I love to rearrange my chairs, tools and books and pull house plants back inside for winter. Everything looks so cozy and inviting, nestled back into its place. 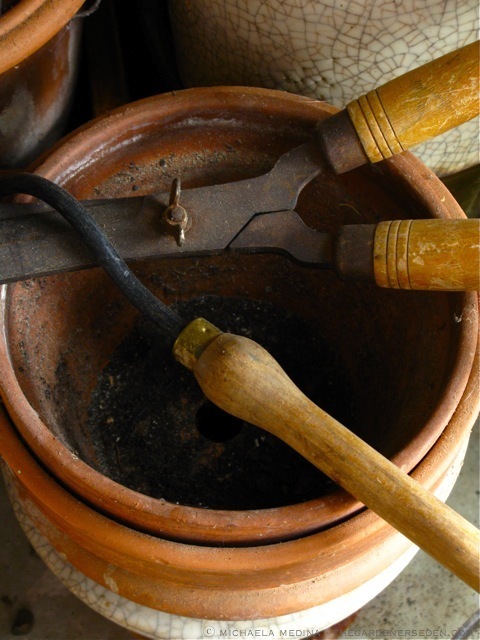 Terra cotta pots are especially vulnerable to cracking during the winter. While I will leave frost-proof stoneware and glazed pots out as recommended by their makers, I always bring my un-glazed clay urns and vessels in by the first week of November. Photography ⓒ Michaela Harlow. All photographs, artwork, articles and content on this site (with noted exceptions), are the original, copyrighted property of Michaela Medina Harlow and/or The Gardener’s Eden and may not be reposted, reproduced or used in any way without prior written consent. Contact information is in the left side bar. Please do not take my photographs without asking first. Thank you! 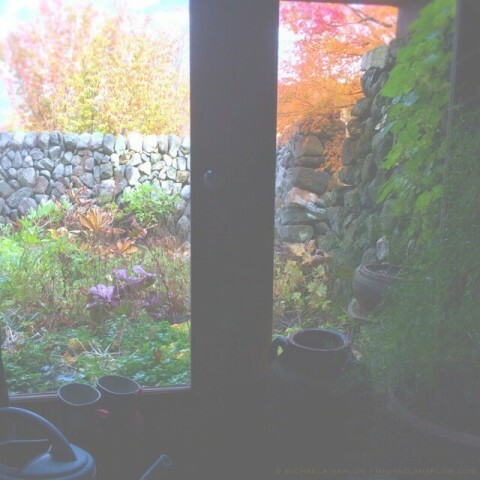 You are currently viewing the archives for Wednesday, October 29th, 2014 at The Gardener's Eden.